Gingerlee has taken the minimalist cafe aesthetic as far as it will go, without asking patrons to sit in an open warehouse. That's no criticism of the cafe: as long as the proprietors are serving quality food off a thoughtful menu and put some effort into their coffee, then artful interior design is just an optional, generally unnecessary expense. In the case of Gingerlee, bare concrete floor, unadorned walls and functional tables and chairs are more than sufficient. Where the interior kitout follows the style of Small Block, the menu echoes Rumi (all three cafes/restaurant being within a block of one other). While eggs are available in various forms on the breakfast menu, they may come with persian fetta; their baked eggs are accompanied by Israeli tomato casserole. I believe, however, that it would be a rare table that wasn't served one of their signature, innovative breakfast dishes: the moroccan tagine style baked eggs with coriander, yoghurt and lemon; or the syrian french toast with orange blossom water, honey labne, rhubarb and pistachio. 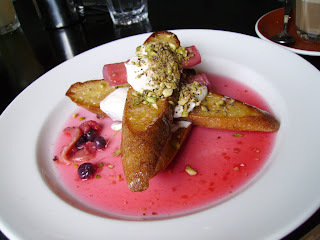 As extraordinary a combination as the first of those two dishes sounded, my heart (well, stomach really) was set on something sweet, so the Syrian toast it was. For visual presentation, what a way to start the day! The sourdough is almost too crunchy for cutting, but going in with fingers reveals a stickiness to the sweetness. The best method is to immerse it in the rhubarb-stained orange blossom until it moistens. While the flavours of the dish universally salute the sweet end of the scale, its textures provide variety: crispy toast, crunchy pistachios, smooth labne (an utter delight for breakfast) and the fibrous rhubarb. A wonderful reinvention of a cafe classic. 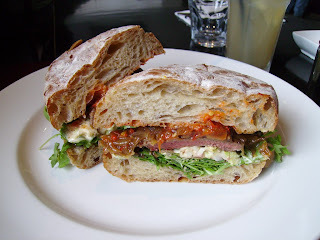 SG was in more of lunch mood, so his choice was the steak sandwich, with celeriac slaw, caramelised onion and tomato chutney The minute steak is seared on both sides, leaving a thin strip of pink meat in the middle. Nice to see such care being taken even on the sandwich meat, and the reward for the customer is a tender filling, offset by the crunch of the slaw and some bite from the chutney. At $14, and as a lunch dish, something on the side might have been expected, but any disappointment is assuaged by the quality sandwiched between the slices of bread.